Historical fiction presents a special writing challenge. Not only must it be credible within itself as a story, but also it must be factually accurate because it covers a real time, real people, and real places that readers can verify. No room for mistakes. Naomi Williams does a terrific job handling this challenge. For her subject she chose the voyage of discovery undertaken by two French frigates in 1785, expected to go around the world and gather knowledge and glory for the mother country; however, they never came back—leaving a big hole of possibility that Williams fills as if she were onboard. Yet the narrative perspective comes from multiple voices. Each chapter is a slice of one person’s drama, and each is complete like a short story, unique from all the others. They tell us about life on a ship and the ocean, the complexity of loading and resupplying in ports from Europe to Alaska to the South Seas, the politics of command and service, how the voyagers were perceived by the peoples they encountered and the conflicts that resulted from their arrival, and the dreary anxiety for families left behind. These individual stories do exactly what historical fiction is supposed to do: show what people and places were like in another time. They cope with their circumstances, use their objects and technology, make choices under the pressures of morality and custom as unconsciously as we do in our lives today. The book is so rich in you-are-there experience that it doesn’t seem to have a plotline like a conventional novel. Most of the characters pass through each other’s lives and never connect again. The real story is the voyage itself and the fact it has no ending. 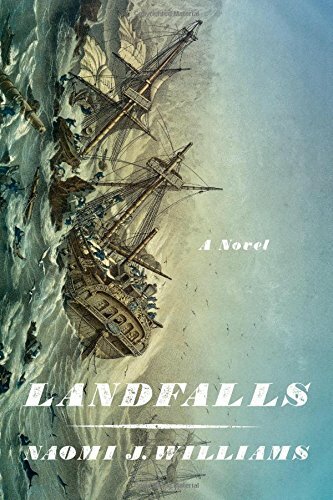 Landfalls uses characters to fill in the blanks and bring the story to closure, as compared to simply using a narrator to describe a protagonist’s historic journey. The craftsmanship is so good, it’s hard to believe this is a first novel. That alone makes the book award worthy. On top of the outstanding technical execution, it tells its tale so well that it becomes interesting and emotionally gripping to readers with zero interest in 18th-century maritime history. Readers who are mildly curious or downright keen on the topic will be rewarded by an informative read that likely will move them to learn more about the period, and the event, and the author. Let’s hope that Naomi Williams finds another topic that compels her, like old maps did this time, and gives us another adventure loaded with triumphs, tragedies, and travails.